From the standard 720p to the exceedingly anticipated 8k, gaming and TV monitor resolutions have come a long way in the past several years. As a result, selecting a good monitor screen seems like lots of work. But the reality is that the science behind image quality and resolution is not so intricate to understand. Screen Resolution is an integral part of selecting the best monitor for you. Hence, we present you with the guide to select the best screen resolution so that you are able to meet all your uses and an enriched viewing experience. Which is the best Screen Resolution? Before we begin with the guide to select the best among various types of screen resolutions, it is first essential to know what it actually is. Screen resolution is the measurement of pixels by estimating the height and width. For example, if a monitor holds 1280 x 720p resolution then this means its height is 720 pixels and width is 1280 pixels. The total measurement of the pixels will be 720 x 1280 = 921600. A screen with higher resolution will deliver sharp and better images. Since the 720p screen resolution rarely exists, so you can select between the other various options available. When it comes about screen resolution then you must have heard about the term ‘pixel.’ The pixel is an illumination of an image. It is an area where the videos or images are composed. Pixel is the standard unit of programmable color on the computer screen. It is not available with a definite size but depends on the panel size and kind of resolution used on it. The aspect ratio is defined as a term to the ratio of an image width or screen width to its height. The aspect ratio is illustrated by two numbers, which are differentiated by a colon and hence written as x : y. Some of the common types of aspect ratios of screens and monitors are 16:10, 5:4, 16:9, and 4:3. The 16:9 is the standard aspect ratio for the monitor screens. PPI or pixels per inch is a measurement of the unit for the pixel density, or the monitor’s resolution, or any other electronic imaging unit for that matter. In some cases, PPCM or pixels per centimeter is used to measure the same. This can be confused with the DPI or Dots per Inch, hence find below the meaning of DPI. DPI or Dots per Inch is a term used in the printing of media or text. It is the physical dot density of an image or an output from a device. The DPI is therefore distinct from PPI, which is a measurement of pixels per inch on the input side of things within an imaging device. Now you have known all the basic terms related to screen resolution, let’s have a glance comparing the different types of screen resolutions. Starting with the 720p resolution HD, it offers twice the clarity of the basic definition monitor screens. But the modern gaming consoles and subscription streaming solutions like Netflix use much higher resolutions. This does not imply that they would not perform on 720p monitors, but it would not be possible to achieve higher viewing results. The 720p is the basic or minimum resolution needed for high definition. Large numbers of people are satisfied with this resolution, and hence, there are some screens still available with this resolution. Screens or monitors with this resolution are much cheaper as compared to other high-resolution options. But one drawback of the 720p resolution is that it has been enhanced upon 3 times now and the picture quality is not as much defined as delivered by other higher resolutions. The 1080p in Full HD offers five times better picture quality than the 720p, which is an excellent improvement. It is a fairly good choice for gaming and TV monitors but is suitable for conventional gaming consoles, like PlayStation 1 and 2. Most of the gaming monitors and TV screens present today hold a refresh rate of 60Hz. This is the total number of time a display is refreshed to show the image. With a 60Hz refresh rate, it can be stated that the image is refreshed 60 times before it is displayed on the screen. This is ideal for casual gamers and TV viewers. For absolute gamers, displays with 144Hz or more refresh rate is a better option. So it is one of the preferred choices for gamers, particularly those who enjoy the first person of action shooting games. This resolution is excellent and ideal to meet all your screen resolution needs. One major reason for the high popularity of this gaming resolution is that it is more affordable as compared to other resolutions available. A major drawback of this screen resolution is that if you wish to use the latest technology then the resolution would not be able to offer you the best result. This is one of the readily available screen resolutions on the majority of gaming monitors, tablets, smartphones, and other devices. It has 4 times more the resolution than the 720p, which is awesome in most of the cases. The resolution stands as an excellent choice for gaming and TV viewing. The price of the screen may vary depending on the size and price, where the price is slightly more than 1080p, but the picture quality is superb. 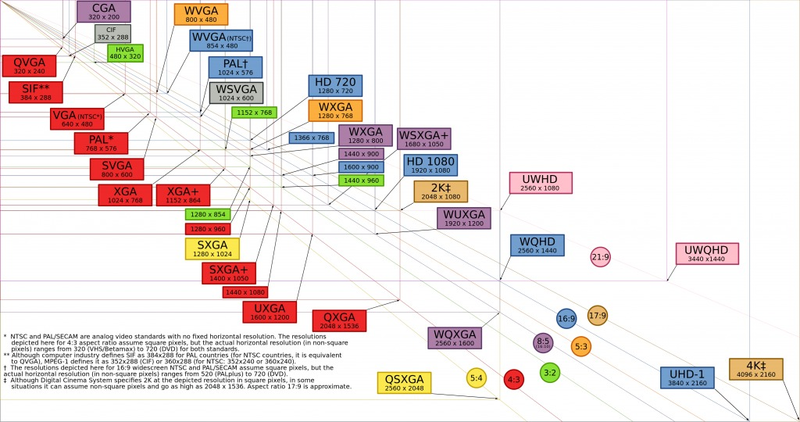 One of the latest resolutions for screens and monitors is the 4k Ultra HD resolutions. It comes with 3840 x 2160 pixels and releases around 8,294,400 small colored dots across the entire screen. This resolution is 4 times more than the resolution of 1080p. By far, the 4k is the finest resolution for the consumer purpose, but just like other best things even it is available at a higher price. Even the price will vary depending on the size and brand you will purchase. If you are a casual gamer or a TV viewer then the 4k will generate an amazing cinematic feel like never before. The biggest trouble you may face with this screen resolution is actually turning the gaming or TV monitor off. Being a new gamer, you would want a gaming or TV monitor that is able to generate higher frame rates for finest visual quality. This can need a large volume of graphics processing power resulting in the possibility to purchase another video card. Conventional games that were not designed for this resolution can appear blurry most of the times. On a concluding note, the 4K resolution for gaming and TV monitors is outstanding. If you have some additional bucks, then investing in this resolution would be an excellent option. The greatly anticipated 8K full ultra HD resolution for gaming and TV monitors is not out in the market yet, but the way resolutions are upgrading quickly, it won’t take much time to be out in the market. It would be interesting to witness the amazing picture quality these gaming and TV monitors will offer. 8k offers twice the horizontal resolution as compared to 4K. It offers sharp and vivid images in a perfect way that even if you stand right in the front of the 8k screen then you will not be able to see any single pixel block. It definitely offers an exciting and enhanced visual experience. High definition or HD resolution is the standard requirement for most TV shows and the watching media. The content is digitally shared across the world. Since 720p displays are highly cost-effective, this resolution is used in most smartphones. Being a high definition resolution has become the basic requirement for the video content world today. Full High Definition or FHD is the resolution for 1920 x 1080p. It implies that the total numbers of horizontal lines in the HDTV resolution video are 1080. These lines are also known as television lines and represent the horizontal resolution power of the monitor. This type of resolution is considered to work best with smaller screens or 24-inch screens. The Quad High Definition, also known as horizontal vs. vertical pixel count of 2560 x 1440 is the basic choice for high-end monitors. This form of resolution offers high-end gaming experience provided that there is adaptive sync support for adequate specifications and in cases of smartphones, it delivers an incomparable experience. The resolution power delivered by a QHD screen is 4 times that offered by a standard 720p HD. This implies that it is possible to fit the same form of pixels on one QHD that would fit in four HD displays of the same size. The color and sharpness precision is enhanced drastically and this makes it easier to view media on big screens and deliver a high-end gaming setup. Also known as WQHD, there is a further boost in this pixel count from 2560 to 3440 at an aspect ratio of 21:9. This form of screen resolution works well with smaller monitors or 27-inch screens. Don’t get into the mistake of considering qHD similar to QHD. The two things can be confusing as their abbreviation is the same. But qHD stands for Quarter High Definition and has a display resolution of 960 x 540 pixels. Different types of resolutions are meant for distinct purposes. Besides the above-mentioned screen resolutions, there are other types also available such as 5k, 6k, and 7k, which can be witnessed in some rare units and devices. These screen resolutions offer good graphics and efficient working abilities, but you need to consider the budget. When talking about gaming, then it becomes essential to consider a screen resolution that is important. It is because the resolution will not just affect the gameplay but would also play a significant role in selecting a perfect solution for PC. If you use low range PCs primary graphics cards then you can select the 1080p monitors with the 60FPS rate. For users having mid-range devices with slightly enhanced versions of graphics, the 1080p combined with 120 to 144Hz monitor will be an ideal choice. Also, you can select the 1440p monitors or 4k displays, but they need a huge task to blend with the frame rate capacity of the screen. So, depending on your requirement and preference you can go for either the most advanced screen resolution or for the greatest screen resolution available at affordable prices, or pick the common resolutions such as 2K or 1080p. ASUS ROG Swift PG348Q Review: Don’t BUY Before Reading This!